The author of the ccMiner fork with support for the X15 algorithm for Nvidia GPU miners, djm34, has updated his code to improve the performance of X15 mining (source). We have compiled a windows binary and the hashrate we got now is slightly better than what we were getting with the previous release. 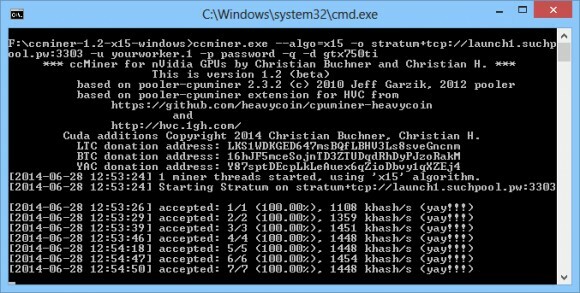 Below you can find a link to download our windows binary of the new miner. Do note that it is compiled for Compute 3.0, 3.5 and newer cards (32-bit version only) in a single binary, so it will not work on older cards. If you are unsure what version of Compute does your video card support check the included GPU Compute Capabilities List file. The binary is compiled with Visual Studio 2010 and is compatible with Windows XP as well if you are still using it on your mining rig. Do note that this fork of ccMiner also supports other crypto algorithms and is not limited to only X15, check the help for more information. The author of the ccMiner fork with support for the X15 algorithm for Nvidia GPU miners that goes by the nickname djm34 has updated his code to improve the compatibility and performance (source). We have compiled a windows binary and have tried the new version on a GeForce GTX 750 Ti and the hashrate we got now is about 1600 KHS, up from about 1450 KHS that we were getting with the previous release. On GeForce GTX 780 Ti you can expect to get around 3000 KHS in terms of hashrate, up from about 2600 KHS with the initial release with X15 support. Have in mind that this fork of ccMiner does also support other crypto algorithms and is not limited to only X15, check the help for more information on supported algorithms. Below you can find a link to download our windows binary of the new miner. Do note that it is compiled for Compute 3.0, 3.5 and newer cards (32-bit version only) in a single binary, so it will not work on older cards. If you are unsure what version of Compute does your video card support check the included GPU Compute Capabilities List file. The binary is compiled with Visual Studio 2012 and is not compatible with Windows XP, so if you do not already have Visual C++ Redistributable for Visual Studio 2012 you will have to download and install it, otherwise you may get error for a missing DLL library. There is now a new ccMiner fork with support for the X15 algorithm available for Nvidia GPU miners thanks to djm34 (source). The X15 algorithm support is still a bit rough, but it works quite well already, so you can experiment with it and try mining with your GPUs. We have tried it on a GeForce GTX 750 Ti where we are getting about 1450 KHS hashrate when mining for a X15 crypto coin such as BitBlock, and from a GeForce GTX 780 Ti you can expect to get around 2600 KHS in terms of hashrate with this new miner. We have compiled a windows binary of the new miner and you can download it from the link below. Do note however that the windows binary is compiled for Compute 3.0, 3.5 and 5.0 cards (32-bit version only) in a single binary, so it will not work on older cards. If you are unsure what version of Compute does your video card support check the included GPU Compute Capabilities List file. It is also compiled with Visual Studio 2012, so if you do not already have Visual C++ Redistributable for Visual Studio 2012 you will have to download and install it, otherwise you may be getting error for a missing DLL library.